Born in Reims in 1798, Alphonse Périn studied in Paris in the atelier of Pierre-Narcisse Guérin, where he met in 1817 his life-long best companion, the painter Victor Orsel. During this period, Périn dedicated himself to the genre of historical landscapes, notably close to the master Jean-Victor Bertin, himself a former pupil of Pierre-Henri Valenciennes. In 1822, Guérin was appointed at the Villa Médicis in Rome, and the two friends, Périn and Orsel, followed their master and stayed in Italy for eight years. The tomb of Cecilia Metella is the most preserved of the mausoleums that stand along the Via Appia in Rome. Built at the end of the first century BC, the circular monument has a diameter of nearly thirty meters, with a height that culminates at eleven meters. Richly decorated with friezes, it carries an epitaph that refers to Cecilia Metella. Historians are not sure about the identity of this wealthy Roman woman and attribute this burial to two different ones: the first, daughter of Pontifus Maximus Lucius Caecilius Metellus and wife of the famous consul Sylla, died in 81 B.C., while the second, who died around 20 B.C., was the wife of a triumvir at the time of Julius Caesar, the wealthy Publius Crassus. 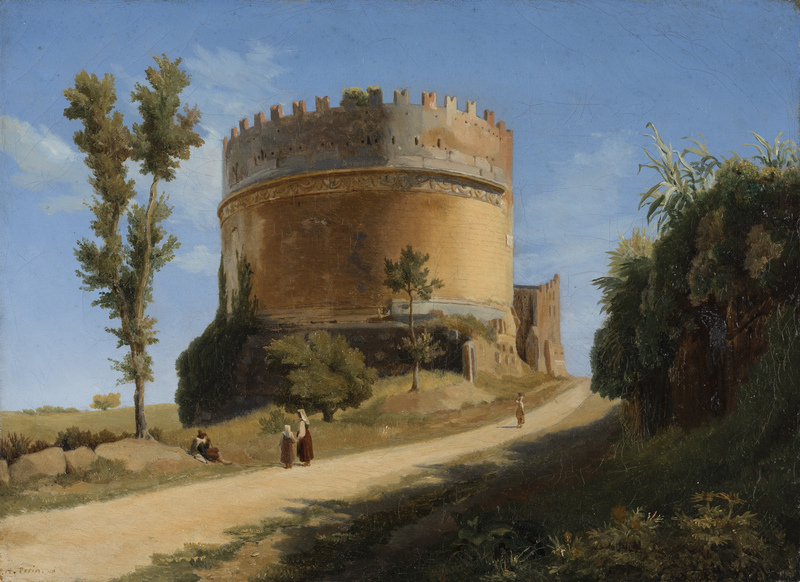 Many artists visiting Rome stopped around, drawing or painting the tomb, without worrying about the identity of its host, as for instance Hubert Robert in the 18th c., and Jean-Baptiste Corot in the late 1820s. Alphonse Périn, faithful to the teachings of Bertin, chose to set the monument in the center of a landscape seen from the other side of the Via Appia. Settled in the shade and on a strip of grass, the painter patiently gave all details of the vegetation and captured brilliantly the plays of the light on the ochre architecture. He animated the scene with a family that stopped near the tomb. The man sitting at the foot of a tree talks to a woman holding a child by the hand, while a second girl has already moved away. On their return to Paris, Alphonse Périn gradually gave up the landscape genre to fully dedicate his works to subjects of Christian inspiration. He and Victor Orsel together received orders for the decoration of the Church of Notre-Dame-de-Lorette, recently built in the Nouvelle Athènes district. It is his masterpiece. Amazingly only few works by Périn of the Rome period remain in private hands, and they are very appraised.